Update: See below for an explanation as to how this happened. 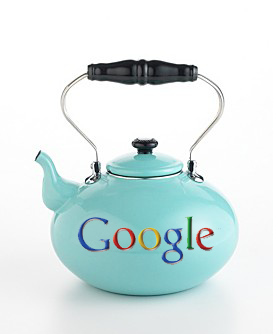 Yesterday an article in The Sunday Times (UK) set the web abuzz over new findings that every Google search contributed 7 grams of CO2 to the atmosphere – half the amount produced when heating a tea kettle (heaven forbid!). I criticized the article for being overly alarmist, with a lack of perspective and possible bias. Google also responded, effectively denouncing the claim. At the heart of the story was a young physicist named Alex Wissner-Gross, who, according to the article, says “that performing two Google searches uses up as much energy as boiling the kettle for a cup of tea”. This sentence alone was enough to rile up reporters around the globe, and has now been repeated in hundreds of articles worldwide. Unfortunately, according to Wissner-Gross he never said anything of the sort (or not, see below). For starters, he says he would never refer to any sort of measurement having to do with tea (he’d go with coffee). But his findings have nothing to do with Google as a company, either – they’re concerned with much more generalized stats, like your computer’s rate of CO2 production when you look at a webpage. Wissner-Gross says that the widely circulated 7 gram/search figure came from some other source (he’s not sure where), and notes that if you read the article carefully it only makes it sound like it’s from his data. He has confirmed that he did make some vague statements regarding Google, including “A Google search has a definite environmental impact” and “Google operates huge data centers around the world that consume a great deal of power”. But the “tea kettle” statistic that has been repeated ad nauseum simply isn’t his. After learning of the misleading story, Wissner-Gross says that he contacted The Times and was assured that it would be fixed by Sunday morning. No corrections have been made. Another concern I had with The Times article was that it neglected to accurately describe Wissner-Gross’s company, CO2Stats. The startup allows companies to purchase renewable energy to neutralize their website’s environmental impact and get “Green Certified” badges to display on their homepages. Because of this potential conflict of interest, Wissner-Gross’s affiliation with the company should have been described in the article, but was only mentioned in passing. Again, it seems like The Times was at fault here, as Wissner-Gross says that he described the purpose of CO2Stats and his role there in detail, though it seems to have been largely ignored by the reporters in question. He may have been misquoted, but Wissner-Gross hasn’t failed to capitalize on the article – he’s spent the majority of the day conducting interviews with news publications as well as radio and television shows, and CO2Stats will likely see a boost (as will the Green IT movement in general). This isn’t the first time in recent memory that The Times has been mistaken about a tech story – in late November the newspaper incorrectly reported on a complicated and fictional Yahoo/Microsoft search arrangement. Jonathan Leake, the Science & Environment Editor at the Sunday Times (UK), has taken umbrage with my choice of words. The Sunday Times did not “make up” the CO2 statistic, he says. Instead, it looks like it came from this obscure blog post, though Leake says that he was under the impression that it came from original research conducted by physicist Alex Wissner-Gross. An <a href=" editorial piece Wissner-Gross wrote to accompany the widely-spread ‘Tea kettle’ article contains the passage “based on publicly available information, we have calculated that each Google search generates an estimated 5-10 g of CO2”, which seems to indicate that the statistic came from his research. However, Wissner-Gross denies that he offered the “5-10 g” figure as his own. In the draft he submitted to the Times, he referred only to “publicly available information”, not to his calculations. Leake has confirmed that the wording was changed during editing, but insists that Wissner-Gross claimed the statistic as one of his own findings during a phone conversation. So where exactly did these figures come from if not from new research? Wissner-Gross says he searched the web for some publicly available information about Google until he came across a blog post written in 2007 on Rolf Kersten’s Weblog. The post estimates that one Google search equates to 6.8 grams of CO2 emissions, which is apparently where this oft-repeated statistic originated. But even if Wissner-Gross is telling the truth and he never misrepresented the origin of the data, he used a blog that could hardly be considered a reputable scientific source (no offense, Mr. Kersten) to write his article.